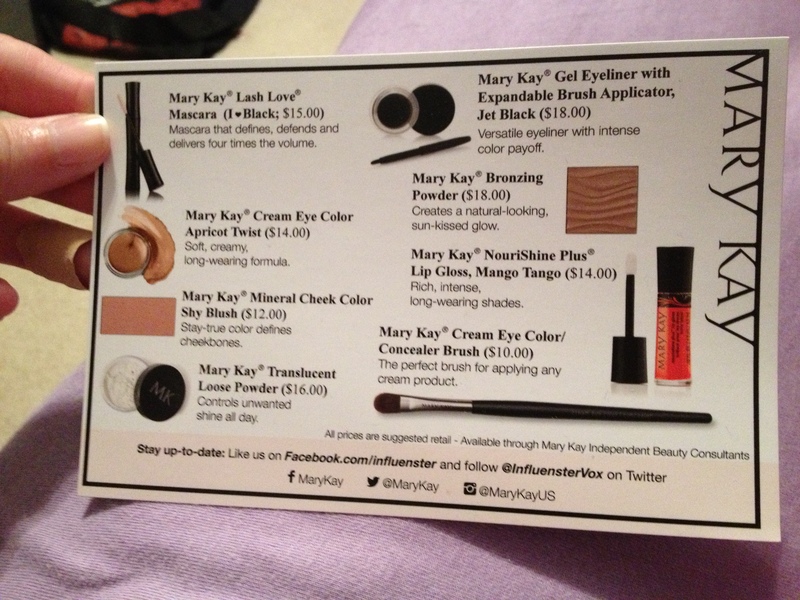 A few weeks ago I received the MK Glam voxbox compliments of Infleunster! I was super excited to try Mary Kay products because I haven’t tried them before. I was surprised with the quality of the different products and I have had a lot of fun trying them out! I am hoping to do a more in depth review of the products after testing them farther but I did want to give you guys a quick idea of my thoughts so far. Look at this awesome box! The first product that I opened was the Mary Kay Lash Love Mascara in I ❤ Black. I am not a mascara person because I haven’t been able to find one that doesn’t make my eyes water. However, I have worn this mascara a couple of times and it hasn’t really bothered me that much! My biggest and only complaint about this mascara is that it is not waterproof. I also noticed that it doesn’t add any volume to my eyelashes. Overall, this mascara is one of the best ones that I have tried and I would recommend it if you are looking for a new mascara! The next product that I tested was the Cream Eye Color in Apricot Twist. I was super impressed with this eye color! I did a quick hand swatch to test the color and found that it is very light and easily blends. I have really dark eyelids and often have problems with eye shadows because they just don’t show up. This eye shadow stood out against my dark eyelids and lasted all day long. I will definitely buy this product after I run out of the sample because it is a very high quality eye shadow. The Mary Kay Mineral Cheek Color in Shy Blush is actually the very first blush that I have ever owned. I don’t really know what to do with it yet but I am learning! I will let you know later how that goes but I am definitely not a makeup guru! So far I can tell that this is a beautiful shade of blush and it lasts all day. I was super excited to see the Translucent Loose Powder because I needed some more and this is so much better than my last powder. What I love most about this product is that you but a small amount over your foundation and it helps make your makeup last all day! An added bonus is that this powder also makes my face look less shiny and more matte. I really love it so far and I am looking forward to wearing it more and more. Gel Eyeliner with Expandable Brush Applicator in Jet Black is something that I have never seen before. I do not wear eyeliner. Like I said before, eye products tend to make my eyes water which is really uncomfortable to deal with all day. I have not tried this product yet but I think that the expandable brush is so cute and is very functional for on the go! The Bronzing Powder that came in this voxbox is really quite lovely. I have not used a lot of bronzer in my lifetime because I am so pale and bronzer tends to make me look orange! However, I hand swatched this bronzer and it is just enough color to stand out on my skin without making me look orange. So far, I think that this is a great product and I plan on wearing it more throughout the summer to achieve a sunny and natural look! Overall, this vox box from Mary Kay was awesome! I would recommend every single one of these products to all of you lovely readers! If you have any questions about any of these wonderful products please feel free to comment below! Thanks for reading and be sure to check out Mary Kay because they rock!